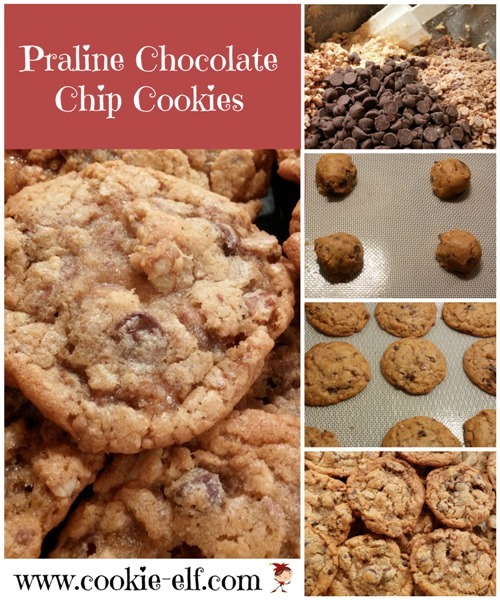 Praline Chocolate Chip Cookies are a scrumptious variation on the classic chocolate chip cookie recipe, especially if you like toffee. The recipe’s chopped pecans and toffee bits add a layer of flavor. This particular drop cookie recipe produces a soft dough, rather than a typical stiff chocolate chip cookie dough. The toffee bits add to the dough’s elasticity, meaning the dough spreads quite easily. Of course, too much spread is too much of a good thing. You can prevent too much spread by baking cookies at an oven temperature higher than the standard 350ºF, which will allow them to set quicker. This recipe calls for an oven temperature of 375ºF, but you can adjust it to what works best in your kitchen. The end result is a delicious cookie that is chewy in the middle and firm around the edges. Preheat oven to 375º F. Line baking sheets with parchment paper. Gradually stir dry ingredients into creamed mixture a bit at a time until well blended. Add chocolate chips, pecans, and toffee bits to the dough, mixing them in with a spoon. Optional: chill cookie dough, covered, in refrigerator for one hour. Drop rounded teaspoonfuls onto prepared baking sheets, 2 inches apart. Be careful not to drop dough in extra large spoonfuls. Bake 9-12 minutes until cookies are light brown around the edges. To process oatmeal, measure 1 cup into the food processor. Pulse it with steel blade until it is ground into flour. 2. Chill dough for an hour. 3. Raise oven temperature slightly.